Several television news organizations are relying on a significant amount of amateur news footage in their broadcasts, but a new report reveals that they rarely credit the citizen journalists who actually produce it. The study from Columbia University’s Tow Center for Digital Journalism examined the handling of user-generated content (UGC) at eight international television networks and their websites. And at a time when ordinary citizens are increasingly functioning as on-scene reporters, nearly three-quarters (72%) of that amateur content that aired on these television outlets was not identified as such. An even higher proportion of on-air footage from amateur journalists—84%—did not have an on-screen credit identifying the source of the material. This analysis of how news organizations use footage gathered by amateur journalists examined more than 1,100 hours of TV news footage and more than 2,200 Web pages on the eight major global TV networks over a 21-day period in November-December 2013. They included Al Jazeera (Arabic and English), BBC World, CNN International, euronews, France 24, NHK World and Telesur. Unlabeled content was identified as such by researchers through cross-referencing on social media and news agencies, as well as on-screen indicators such as camera skill and production values. In the period studied, the practice of crediting amateur news content—naming the person who produced the footage—differed significantly by outlet. Researchers said CNN International credited 53% of these outside contributions on its air, the highest percentage of any outlet. 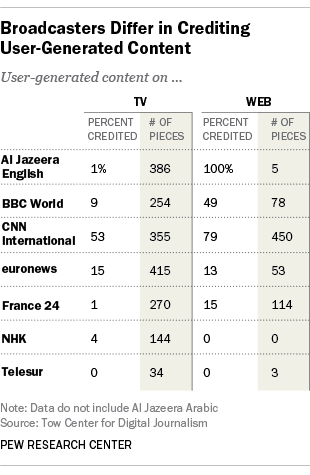 Conversely, only 9% of the citizen content on BBC World was credited while that number dipped to 1% on France 24. The report also reveals how much television news now depends on contributions of those outside the newsroom for news coverage. On average, 11 pieces of user-generated content aired daily on each of the television newscasts at seven of the eight outlets studied. (An eighth—Al Jazeera Arabic—featured an average of 51 such clips each day. Because it used so much amateur content, AJA was studied separately.) Latin American network Telesur featured the fewest pieces of video or other footage of a news event recorded by citizen journalists with, on average, about two per day. In an indicator of the role that amateur video now plays in the news landscape, 40% of all the television user-generated content analyzed and 20% of digital content dealt with the conflict in Syria, a very dangerous environment for newsgathering. According to the press monitoring group Reporters Without Borders in the past three years, 117 citizens reporting the news have been killed in Syria compared with 36 professional journalists. The question of how news organizations identify outside material to their viewers also raises some ethical and legal issues that may, over time, involve a significant slice of the population. Recent data from the Pew Research Center find that 12% of social media users in the U.S. have posted their own videos of news events onto social networking sites like Facebook or YouTube. And as many as one-in-ten (11%) online news consumers have submitted their own content—videos, photos or text—straight to news organizations or blogs.